I went to and presented at ScaleConf in Wellington last week and was really impressed with the topics and info shared. Here’s a quick round up of my highlights from ScaleConf, a one-day conference with a focus on building and running large scale web apps. Kumar Srinivasamurthy, Tech Lead from Bing. Being the second largest search engine means serious scale, Kumar shared some fascinating insights into what it’s like behind the scenes of 100,000 server data centres, I particularly liked his anecdote on how hard it is to actually turn off a datacenter, with redundancy even at the utility level. Andrew gave a good overview of the growth of Timely, the phases they went through and challenges. I was inspired by what Timely have created both for software and team/work environment and culture. If we can build A2X up to that level, and create the same team, I’d be very happy. Pam detailed here project for a production mobile backend using AWS Lambdas, so it was very close to my own interest in server-less architecture. Having built a few Lambda functions for internal projects, I was really interested to see the sort of challenges that go into making it a fully production ready platform. The tool support for setting up the functions has improved a lot too, I think this is going to be a very interesting area of computing over the new few years. 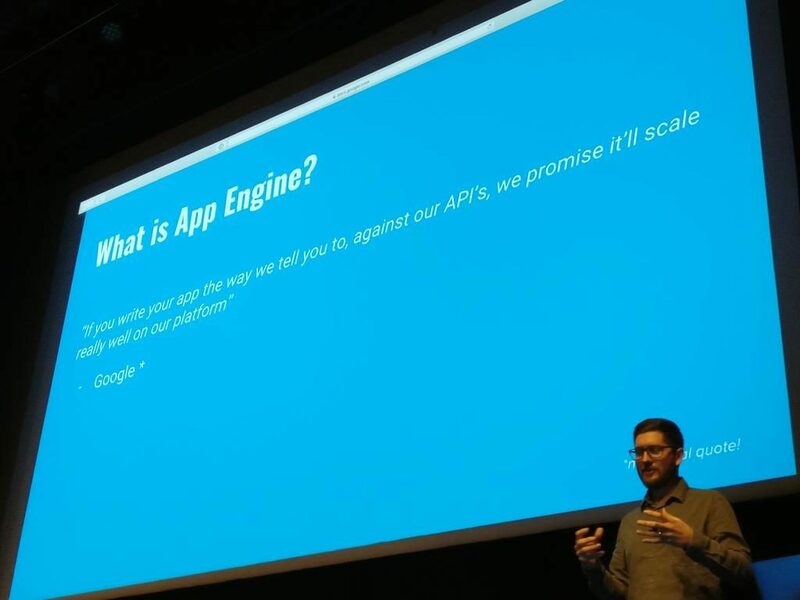 If you’re interested, my slides are here, I presented A2X and our architecture on Google App Engine, what I liked about it and how it helped us go from prototype to 1000’s of users. If you’re building a fast-growing or at-scale web app, I’d recommend checking it out next year! Thanks to Christian and the team of putting it together. Taking GWT 1.5 RC1 for a spin – a review of the new GWT release candidate.